In April of 2009, as the chill and damp of our southern winter eased into the mild sunniness of spring, Delcia and I began to make plans for our first full riding season. After our autumn orientation to bikes, we hadn’t put away our motorcycles for the winter. But during those three months around the solstice our rare days on the road had been carefully chosen for their unseasonable balminess and abundant sunshine. And with the coming of spring my bike-riding soulmate and I were feeling confined and deprived. The promise of warm(er) nights and friendly campgrounds was an urge to be satisfied as soon a we could find the opportunity and the the plan do so. Delcia cobbled together enough vacation time and unused holidays to grant her three week’s liberty from her job, and we set about plotting a course and drafting a timetable. Not all romantic destinations beckon from just a few hours up the road. From our starting point in northern Georgia, we looked at our map of the east coast and whittled the list down to two must-do states. In the process, we preserved plenty of freelance options to keep from turning our relaxed travels into a race against the clock and calendar. The top priorities were visits with loved ones we had not seen in more than a year. Delcia’s mother lives in Maine, and that opened marvelous prospects for meandering rides along the rocky downeast coast and through the Acadian woodlands. I have two daughters with families in eastern Massachusetts, and that’s always a hospitable venue for bikers. In addition, there were the adventures to be found at random waypoints along our wandering route to and from those fond reunions. The trip was set for June. In all, we were contemplating a northward loop of nearly 4,000 miles, and clearly we would not be covering that distance on motorcycles in the time we had available. Oh, it could be done, if we planned to be on the bikes for 200 miles every day with no leisurely stops for the pleasures that motivated the trip. No, we had to find another way to combine our long highway travels with some shorter backroad motorcycle rides to capture the flavor and the essence of a real bikers’ vacation. We found our solution astride a robust pair of tires and topped with a solid platform specifically designed for our purpose. The trailer we bought is fitted with three, side-by-side motorcycle tire chocks. 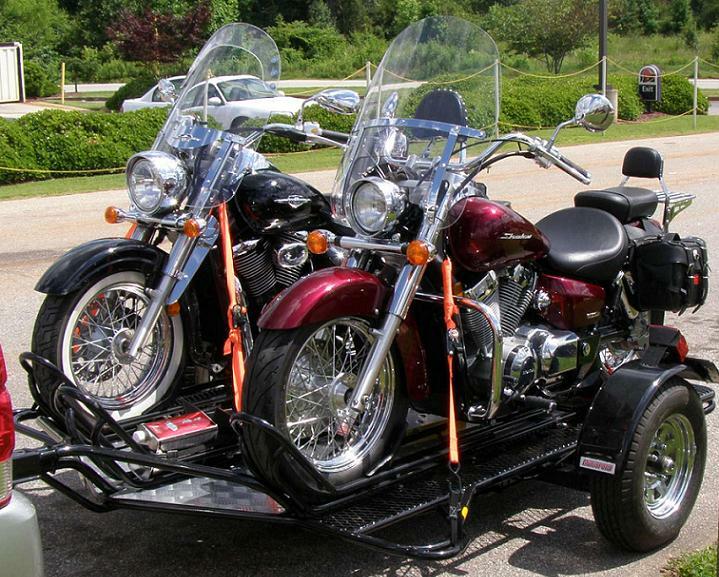 It will transport a trio of smaller dirt bikes or sport models. 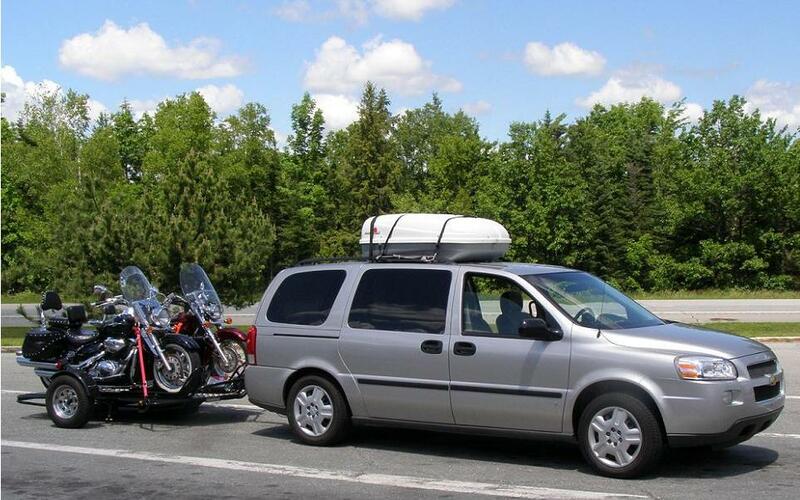 Or it will carry two touring bikes in the outboard chock positions. We used the center position once before our vacation, to take Delcia’s bike in to the Honda dealership for warranty work. The trailer’s next call to service was the real deal. Snugged up behind our Chevy van, the loaded trailer followed us through the Carolinas at surprising highway speeds. It was smooth and stable on the road and required only the attention and care that prudence and caution would suggest for such an unusual and heavily laden automotive appendage. Our first campground, in eastern Virginia, made good on its promise of three days in the countryside with convenient access to the historic sites of the region. The park-like setting in which Colonial Williamsburg and Yorktown and Jamestown all reside offers stunning lessons in history from the cradle of America’s birth. And the scenic roadways through the surrounding marshlands make it a spectacular biking destination.